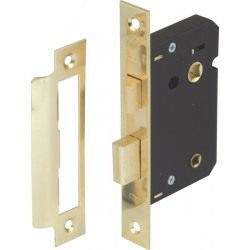 Nickel finish bathroom lock for use on internal doors. 44mm backset - 64mm Case. Operation: Latchbolt by lever handles. 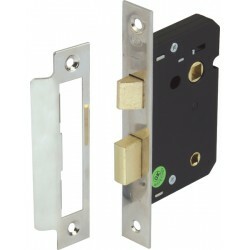 Deadbolt by turn or emergency release. Followers: Latch 8mm. For use with sprung lever furniture. Deadbolt 5 mm. For use with turn/emergency release. Note: ±3 mm tolerance on dimensions.